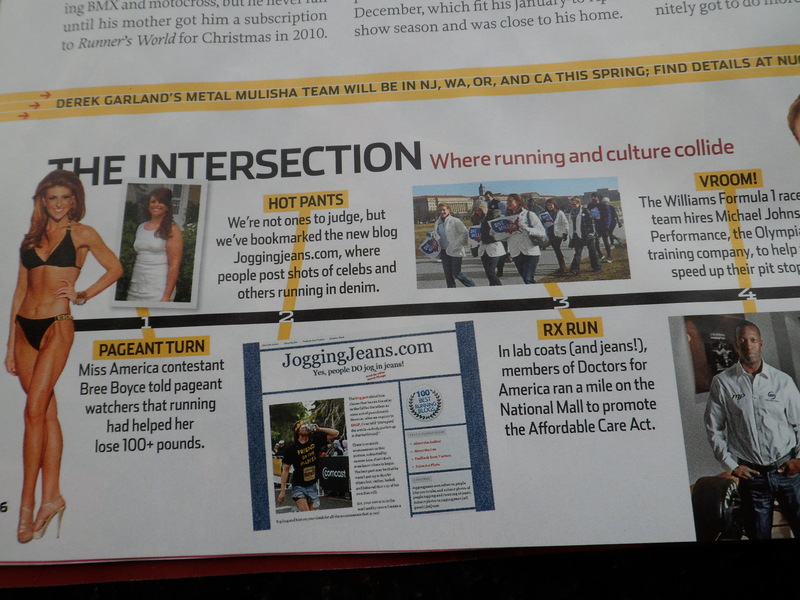 Is Runner’s World endorsing jeans for running?! Looks like it! How awesome is that arrow pointing to Mark Remy‘s favorite pair of running jeans? Bart Yasso jogging IN JEANS! Okay, so it is not real life where Bart Yasso runs in jeans but rather in my fantasy-world. 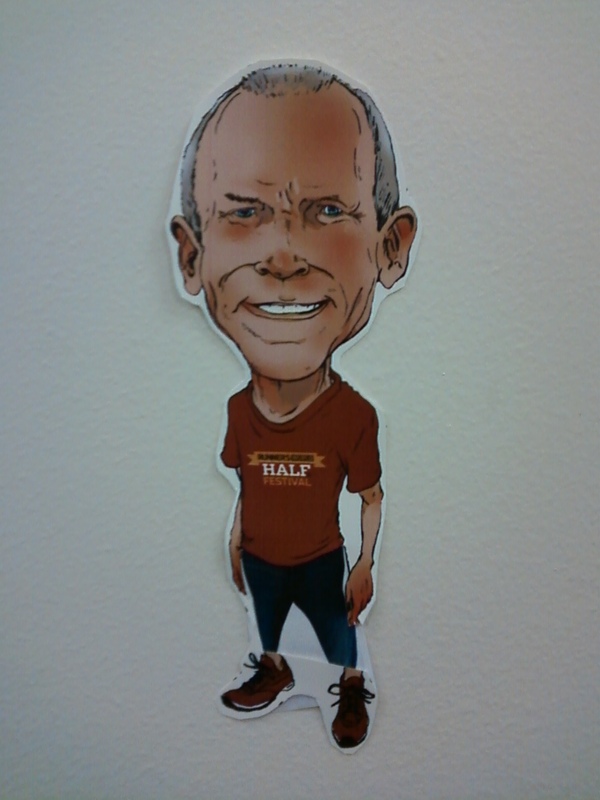 So when I heard about Flat Bart, I knew what I had to do. First, he needed appropriate running attire. There is a lot of buzz about his big head, but why is no one talking about his stubby, chicken legs? It was near-impossible to get those legs into a pair of jeans! We were going to go for a run together, but his short legs couldn’t keep up with me (Bahaha!). 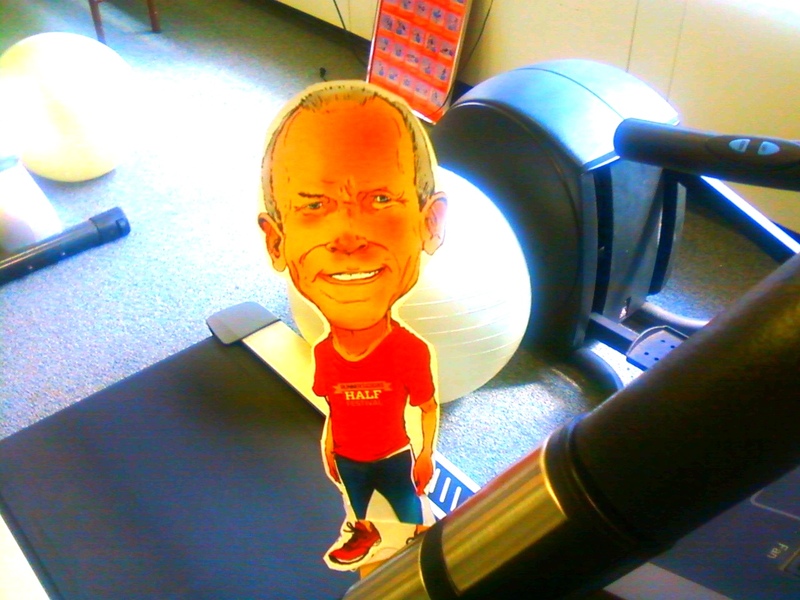 So Flat Bart hit the treadmill and I hit the streets. So there you have it – Bart Yasso jogging IN JEANS! Runner’s World – April Issue, Page 26! You would think that the girl who writes this blog would, when she looks at a picture, notice the guy running in jeans. Nope. It took Susan, author of the blog She cooks, she runs!, to email me this picture of a guy IN JEANS and IN HEELS and point him out to me. Perhaps, when I first looked at the photo earlier in the day, I was too distracted by the shoulders of the man in the center to notice Mr. BowTie in jeans? The picture was taken during the 2011 Zappos.com Las Vegas Rock ‘n’ Roll Marathon Stiletto Run held on December 3, 2011 and was posted on yesterday’s RW Daily feature on the Runner’s World website. Runner’s World shows JoggingJeans.com a LOT of love. There was love on their Facebook page when the blog began and again this week with an AWESOME mention. 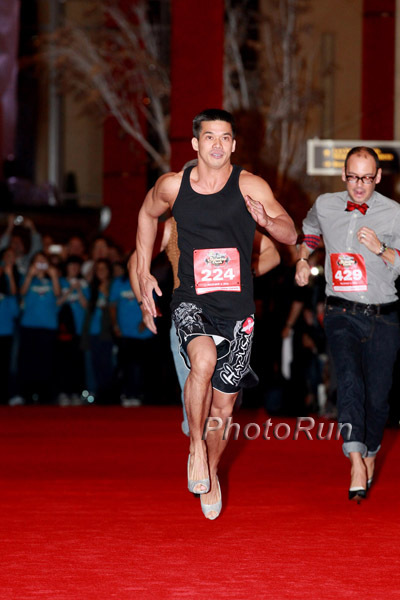 BTW, Mr. SexyShoulders won the Stiletto Run. Does anyone know his name so I can properly stalk acknowledge him?